As I have said before, the best way you can thank me for my services is to drop me a note and send a picture. Here is a picture of a cruise wedding I did on 17 April for a couple from Tucson, Arizona who were visiting on the "Carnival Conquest." Below is their note, verbatim.
" I WANTED TO THANK YOU FOR YOUR GENEROSITY AND MAKING OUR WEDDING DAY VERY SPECIAL. I WILL RECOMMEND YOU TO ANYONE AND EVERYONE I KNOW. 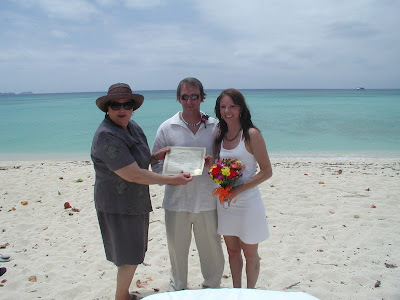 THE AMAZING ISLAND, THE BEAUTIFUL WATERS, THE WHITE SAND BEACHES, AND THE PERSONAL CEREMONY WILL FOREVER BE WITH US.